Movie review: The Wedding Party is an extended music video. But is it fun? 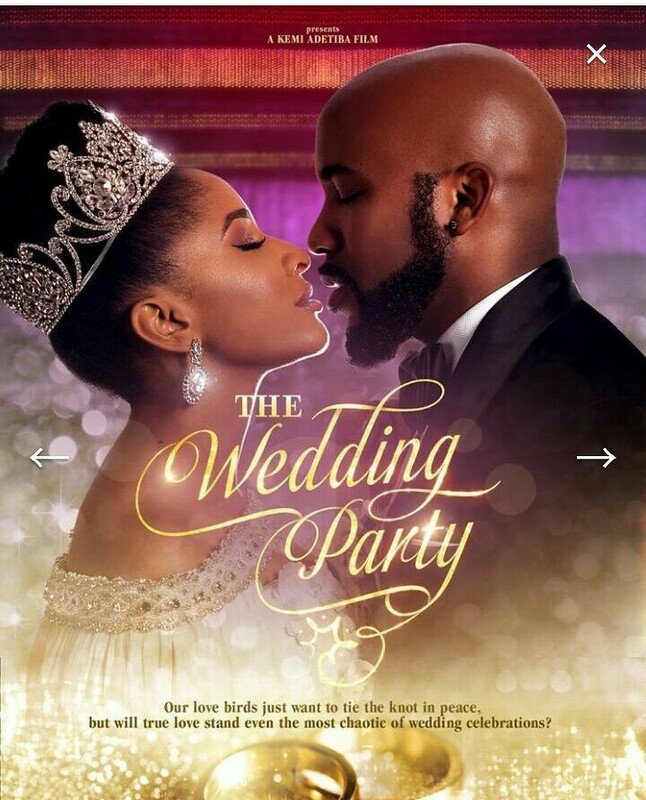 The trailer for The Wedding Party, the feverishly anticipated event movie from the trio of EbonyLife Films, Inkblot Production and Koga studios is a glamorous, 3 minutes long mash-up of popular faces and familiar romantic comedy tropes that stands the risk of giving the plot of the entire movie away. If the final cut of the film manages not to do exactly that, it is only because there is barely a thread of a plot for The Wedding Party to hang on to ab initio. What exists instead is the premise for a potentially exciting romp. One that has served as a broad canvass for countless Hollywood films of the romantic comedy genre but curiously, has received short thrift this side of the Atlantic. And it is a surprise no one has thought of this before. Well actually, Bovi has, with his earlier in the year release, It’s Her Day. Nigerian weddings, as lavish and chaotic as they come, are usually so busy, yet so entertaining, that more than enough stories can be mined from the numerous going ons. No one can accuse the producers of The Wedding Party of any deceit as their film is exactly what the title suggests. The Party,- that day long garrulous display of wealth and undisciplined social behaviour (in equal turns,) that manages to bring out both the best and worst of the humans who throng the venue (in this case, it is the Eko Hotels & Towers) for some hours is the real star of the show. And it is a shame that possibly budget or technical limitations stopped the production design team from really going for it in terms of scope and detail of the wedding reception. Not that what is presented on film isn’t pleasing to the eye. Matter of fact, the sets are capable and they photograph well enough but if you want to make a film about a wedding party, in Lagos, curated by two wealthy and showy families (one Yoruba, the other Igbo,) you better go all the way and shut that party down. This one doesn’t. Not quite. There are characters that attempt to create a story worth caring about but they are only here to fill in the spaces and go through the motions. What is a wedding without the couple? And so we have here, Dunni Coker (Adesua Etomi) the beautiful, virginal bride who exists mostly to be gazed at in a stunning scene where she walks down the staircase in an over the top bridal gown designed by the maestro himself, Mai Atafo (in a cameo). There is also the groom, Dozie Onwuka (Banky W) who is in the picture for eye candy mostly, but also to test the resolve of his bride and then to mutter sappy lines like ‘’I have never needed anyone in my life the way that I need you,’’ that could easily have been lifted from one of his love songs. There are also stock characters that fill out every other scene, and every wedding film ever made. You name it and they are present. The harried wedding planner (Zainab Balogun,) whose job it is to get everyone in place. Check. The lovable lothario of a best man (Ikechukwu,) who means well but can’t help leaving crisis in his wake. Check. The ice cold, soignee mother of the groom (Ireti Doyle, who else?) Check. The overly dramatic mother of the bride (Sola Sobowale.) Check. The bodacious vixen (Beverly Naya) with hate in her heart and mischief in her sights. Check. The slutty bridesmaid (Somkele Idhalama) who tutors virginal bride on the ways of the world. Check. The actors who play these characters are taken straight out of central casting. If you have established a reputation earlier of playing a certain type of character, then you were called to do the same here. Nothing to stress yourself about. They all do fine work. This explains the presence of Richard Mofe-Damijo and Ireti Doyle, the go-to actors for upper/middle-class couples of a certain age. They both appeared in Dinner and The Grudge this year and acting as the well-heeled Onwukas in The Wedding Party, they merely reprise their roles, even if RMD’s Igbo is wobbly and nobody of South Eastern extraction would refer to themselves as “Ibo” (it’s “Igbo”), the way that Ms Doyle does. Still, their dynamic is well rehearsed by now and they settle in quite comfortably. Central casting is also responsible for Sambassa Nzeribe’s idiotic foil and Kunle Idowu’s bumbling tool. Directed by Kemi Adetiba, she of the high concept music videos, The Wedding Party benefits from Adetiba’s background as she is able to juggle all these characters and apportion the right amount of screen time in order to keep her pacing fast and fun. Apart from some red flags, like the overbearing wedding speech by the father of the groom for instance, the haves and haves not sub plot involving Sambassa Nzeribe, and the entire existence of Hafiz Oyetoro’s gate crashing character, Adetiba keeps things moving briskly. But in her feature film debut, Adetiba cannot quite leave her origins behind and at times the entire film feels like an extended music video, what with the celebrity cameos and extra judicious use of pop music. When the Igbo group is dancing in, expect that they will be moving along to Flavour’s Ada Ada, and the couple themselves? Surely Kiss Daniel’s Laye was made for moments like this. There is some disconnect between the music and the dancers such that it isn’t always quite sure if the actors are dancing exactly to the beat of the music that the audience can hear. All of this points to a screenplay (credited to Tosin Otudeko and Kemi Adetiba) that knows what it is about and doesn’t take itself seriously. The laughs come in bursts and when they hit their mark, they do so accurately, as with Sola Sobowale’s theatrics and Kunle Idowu’s silliness. The comedy is obviously the saving grace as not many will care much for the romance, except to be assured that it all ends well. And for films like this, the ending is never in doubt. As the film goes on, the antics get more preposterous and the rushed and clumsy final act is a bit of a downer. But The Wedding Planner, part of the Lagos showcase at the Toronto International Film Festival stays true to its promise. A well-presented, glamorous snapshot of escapism. Who can say no to that?